Even if you’ve not got big party plans this Halloween it’s always nice to carve a pumpkin, light a few candles and squirt some fake blood around while you’re sat waiting for trick or treaters to knock on your door. 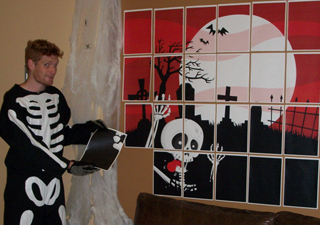 Well this year if you’re wanting to make a little more effort but don’t have any pennies to spare, then with a little imagination and a Kodak All-in-One printer, you can create huge, creepy Halloween posters without breaking the bank. Kodak’s new Big App (which admittedly isn’t the usual kind of app we cover on Shiny Shiny), makes it really easy for you to print super-sized images at home, so you can personalise your Halloween decorations with just a few clicks and sheets of paper. To get started you can check out the Halloween images in the Big App gallery, or just upload your own and then start printing. Try out Kodak’s Big App in time for Halloween. Skeleton body optional.